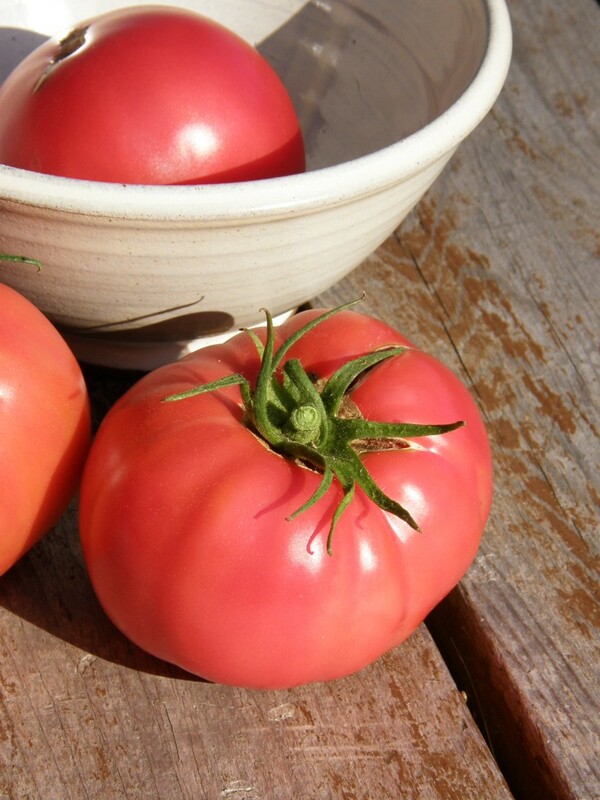 The Savignac tomato is a medium to large sized tomato native to the Lanaudière region of Quebec. Lanaudière is situated northeast of Montreal, between the St. Lawrence River and the Laurentian Mountains. The variety is well adapted to Quebec’s cool climate and short summers. The fruits are round (8-10 cm in diameter) with a reddish pink colour. The taste is juicy and sweet. The tomatoes reach maturity between 75 and 80 days and the plants are very productive. They can reach more than 2.5 metres in height. In 1948, Father Armand Savignac, cleric of Saint-Viator at the Seminary of Joliette, obtained the seeds through Raymond Dufresne from Saint-Felix-de-Valois in the Lanaudière. He was so impressed by the vigor of the plants that he abandoned all other cultivars in order to devote himself exclusively to the cultivation of this tomato. He named it in honour of the man who had given him the seeds. It is for this reason that is also known as the Dufresne tomato. At the time, attitudes strongly encouraged the use of chemical fertilizers and synthetic nutrients in agriculture. These methods did not fit in with Father Savignac’s values, so he cultivated his fruits and vegetables using organic methods. Orchardists in the area have said that the tomato variety has been in the Montreal area since the 18th century and was common until around 1950. There are currently only two seed companies producing the Savignac tomato and consequently the variety is at high risk of being lost. Slow Food Lanuadière, in collaboration with Jean-Francois Levesque of Jardins de l’Écoumène, is working to revive the variety. Our first try with this seed.We live in st. hippolyte…..should br at homr in this climate. Hope our crop is plentiful.